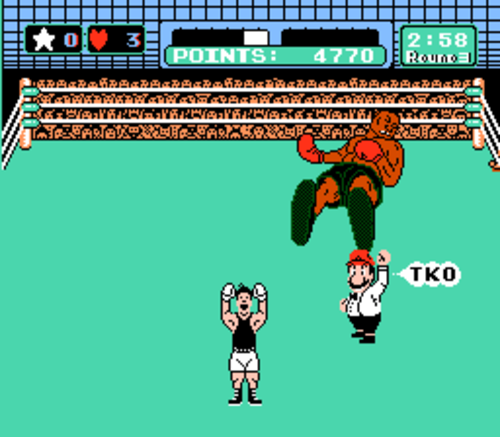 I miss Mike Tyson's Punch-Out. Countless hours and several all nighters were spent mastering this game during my middle school years. Unlike today's button mashers, Punch-Out was a game of skill and repetition. Each boxer attacked in the same pattern every time, and the agony of having to start from the beginning if you lost was strong motivation to maintain focus. The unyielding determination I had is impressive to me now. I remember playing my way up to the Tyson fight and losing several dozen times before finding out that I simply had to dodge his punches for a minute or so until he got tired. Then, the previously invincible Tyson was vulnerable. At the moment I KO'd Tyson, all the lost hours were forgotten. The time instantly became a necessary component of the accomplishment. 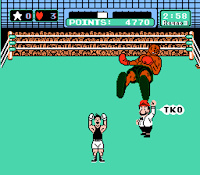 Too bad that Mike Tyson's Punch-Out didn't include a feature to just wait and fight an out-of-shape Tyson in Japan. It feels a little clichéd to point out most of that childhood determination of mine is now gone. But why would I want to go back? Today we live in a world of cheat codes in the form of Google, mobile apps, and Twitter -- and I, for one, love it. (Plus, now I have four televisions and a wet bar in my living room. Take that childhood!) If one of my TiVo's misses an episode of Community, I can grab it online. Better yet, I can read the plethora of recaps, reviews, and reactions available online and decide whether it is worth my time to watch. I haven't bought a (non-children's) movie in many years. Sometimes I purchase music, but I can't think of a whole album I've bought that wasn't by Spoon or some Jack White incarnation. On March 29, 2011, Saint Arnold Brewing Company sent Houston and some other lucky Texas cities into a frenzied quest with the release of their one-of-a-kind limited batch series, Divine Reserve. This eleventh iteration of the series is a Double IPA, described by Saint Arnold as being brewed with "Simcoe, Columbus and Centennial hops from the Pacific Northwest, resulting in a very citrusy, hoppy beer." While these Divine Reserve releases usually pique my interest, I am typically satisfied watching the from the sidelines while Saint Arnold's Army and other beer nerds stand in long lines and scour the town until every six pack in the city is gone before lunchtime on the release date. But is the payoff worth the frustrations? In the past, I've suggested that it is not. Brewery employees and devout members of their army will get all up in my face point out that DR4 won Gold at the World Beer Cup. Vanilla/vanilla, chocolate/strawberry, let's call the whole thing off -- you guys. In my opinion, the series didn't hit elite status until the November 2009 release of Divine Reserve No. 9, an Imperial Pumpkin Stout. I'd love to always have a few DR9's in the fridge -- and sometimes my tweets make a difference. (Either that or Saint Arnold realized the potential of this beer independently.) According to sources typing things that brewery owner Brock Wagner says, DR9 will return this year as a seasonal release. Dreams do come true, y'all. Even after falling in love with the chocolate-y, pumkin-y, spicy DR9, I didn't really seek out the English Style Barleywine that served as DR10. If I can get a taste, what is the motivation to enter the rat race? Fortunately I came across a bottle on a road trip. My plan on DR11 release day was something similar (without all the cannibalism). Plenty of distractions and excuses stood between me and a pointless search for a beverage. And there was work too. With a set of blueprints to review on one screen and Hootsuite on the other, I stood by as the #DR11 tweets scrolled up the monitor. Wait, poor Mr. Andy is losing because he put responsibility above the search for a beer? Hogwash. Just look at the line outside the downtown Specs! And these drawings on my screen aren't reviewing themselves. Ten o'clock is pretty close to lunchtime, right? A wise man once said: "Resentments are the rocket fuel that lives in the tip of my saber." Winning. Let's go score some DR11!! Assuming that visiting Houston's FAO Schwarz of fine foods and adult beverages would be like walking into a kids party at Chuck-E-Cheese, I resisted the drive to the Specs World Headquarters and instead headed toward Central Market. Once in the car, I had a better idea. Why should I bother driving all the way out to Central Market when I pass a ton of grocery stores on the way? Damnit Texas Legislature, why does getting a six pack have to be so hard! 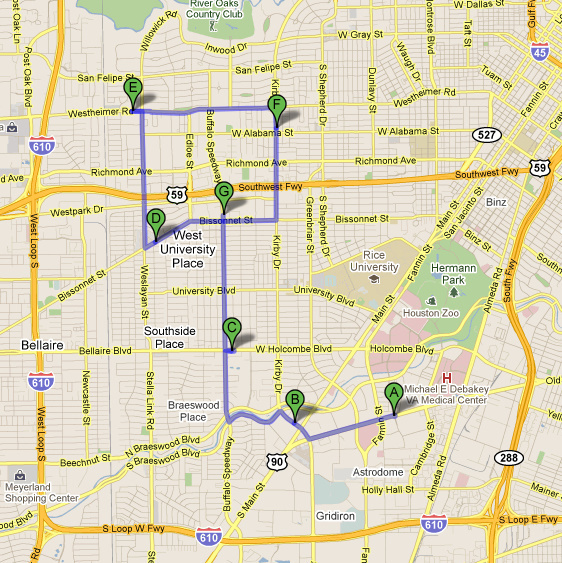 Leaving Houston's Med Center, I constructed a sensible route. STOP 1: Kroger at Main and Kirby. My assumption is that large, fancy pants grocery stores are the most craft beer friendly. Wouldn't it be nice if I could shut the search down after investing less than 5 minutes? It sure would have been. Strike one. Now I remember why I stopped searching for this stuff after my DR1 failure. STOP 2: Randall's at W. Holcombe and Buffalo Speedway. The pants are even fancier in West U. Apparently a lot of housewives do their shopping after a morning workout. If there were any beer nerds roaming about, I didn't notice. I also didn't see any DR11. Strike two. Grrr. 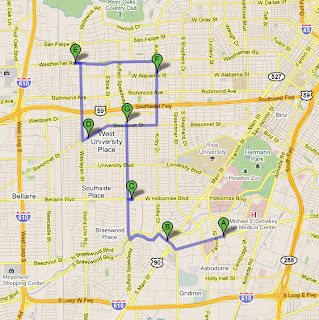 STOP 3: Specs at Bissonnet and Weslayan. On my way to Central Market, I remembered about the huge and relatively new Specs store at Weslayan. If rich trophy wives do their grocery shopping after their morning workout, older mature ladies get fixed up and hit the liquor store. This spacious store was filled with the finest swill available in the state of Texas, a bunch of stockers, several cougars, and me. Notice I didn't add cases of DR11 to that list. I really don't understand how we can put a man on the moon, but we can't have an Android app that shows me on a map where DR11 is located. Strike three. To possibly salvage the stop, I searched the Whiskey aisle for Stranahans. No dice. Returning to the car, I rationalized my frustrations by reminding myself that I should have just driven straight to Central Market in the first place. It is the only store nearby that I had real-life (Twitter) confirmation of stock. It was almost lunchtime and certainly the army had sucked Houston dry of DR11. The consolation loot in the back was -- who am I kidding -- just consolation loot. To quit now is to acknowledge defeat. STOP 5: Whole Foods at Kirby and W Alabama. Whole Foods is the antithesis of my being. My plan was to hold my breath, keep my head down, and head for the beer section. However, immediately after entry I got disoriented and somehow lost in the chilled soybean product area. Short story short, this was strike five. I was disheartened. Dispirited. Downhearted. Discouraged. Depressed. And that is just what Microsoft Word just told me are synonyms for "deflated." I wasn't really hungry anymore. I sat in the car and pulled up twitter on my phone. Hopeful. Positive. Bright. Cheerful. Sanguine(?). That is right, Microsoft Word! All of that. STOP 6: HEB at Bissonnet and Buffalo Speedway. Eureka! I had struck purple gold. As the most interesting man in the world (to me at that moment) was casually leaning on a pallet jack's handle, his partner without prompting bestowed upon me two six packs of DR11. After an hour and a half of failures, I didn't even have a witty anecdote for this salting. "Thank you." I proudly took swag and headed to the checkout. On my way, no less than ten identical, giddy beer nerds in their khaki pants and dark button up dress shirts passed by me. Ha! Luckily I was looking sharp in some JoS. A. Bank today. It was merely a coincidence I was wearing the tan pants and a green plaid shirt. The color is deep amber with a light, creamy head. The nose starts off with a touch of citrus but then turns decidedly into peaches. The taste starts off with creamy malt resulting from the pale 2 row and caramel malts and Saint Arnold yeast. The hop bitter starts low then builds to a crescendo, but always maintains a balance even in its big finish. The hop flavor continues to be peaches, an interesting manifestation of the Columbus, Simcoe and Centennial hops. This is the first Divine Reserve that we have filtered. This decision was made to make the hop flavors brighter, plus it would have been a bottling nightmare with all the hop bits in it. This beer is best enjoyed at 45° or even a little warmer. Though the recipe and style indicate this beer to be enjoyed fresh, we expect this beer to develop interestingly over the years. If you've skipped to the end looking for my opinion, then here is an amuse bouche. DR11 is good. Very good. I feared with the myriad of IPAs in the craft beer market that DR11 would have a hard time competing, especially given its exclusivity, which inevitably leads to higher expectations. DR11 lives up to expectations and may even exceed them. The beer's nose is more wonderful than the words describing it in Saint Arnold's tasting notes. The hop bitterness is dynamic enough to make the entire sip enjoyable, and it does not fatigue the palette. Cheers to Saint Arnold and Divine Reserve No. 11, and cheers to this adult version of unyielding determination. My time invested in this quest paid huge dividends. * Apparently, to skip straight to Tyson you just enter the code 007 373 5963. I hope there is a similar code for skipping straight to DR12. Hmmm, my search was about 1/12 the effort resulting in 1/12 the booty. Went to Boondoggles in Clear Lake. Didn't even think to ask about it, but someone in my party did. They had a few cases left, bottles only. That's enough for me! I like the sweetness (my word, most would use citrus) and hopiness (I think these days the IPAs are trying to overhop just to prove a point, not the case here). I had a nontrivial hangover in the morn after just one (and several other non #DR11 beers that usually don't give me a hangover). Worth it. Interesting comment regarding whether or not the DR beers are worth the hype and the cost. Several of us are going to put it to the test with a blind tasting of DR 11 and several other double IPAs. The results may be food for thought regarding future searches for DR#?. Check back in here or hit me at @theferm on twitter with the results of your blind taste test. I'm very interested. My gut feel is that it is unique enough to stand out. In fact, you may be able to pick DR11 from the crowd. Whether or not it is "better" than the others, I'm not sure, but I'm eagerly awaiting what you find out.